The toy-like charm and fluid playability of the OP-1 makes its return for 2019. OP-1 is an all-in-one portable synthesizer, sampler and controller. With additional features like the FM Radio and an assignable G-Force sensor for motion controlled effects. With OP-1's built-in Tape feature you are able to record everything you do on to the 4 tracks, with overdubbing, reverse recording. Now with an updated OLED screen and reconfigured PCB, the OP-1 has been reimagined to increase the amount of fun and creativity capable from this powerful, all-in-one synthesizer. The OP-1 Rev 2 has been refreshed, reimagined, and reconfigured for 2019. The updated features include a brand new PCB and an update to all important OLED screen. 10 built-in synthesizer engines, multiple effects and LFOs. And some really unique sequencers ready to explore. Connect it to your computer and control your DAW with the common play, stop, rec, forward and rewind. Use the 4 rotary encoders and 8 x 2 dedicated quick keys for fast selections. Record everything on the built-in 4-track tape. Match the tape speed to the sequencer clock for some really nice overdubbing with changing pitch. Change tape speed while recording, or even record backwards in real-time. Switch to the four channel mixer and add some texture with the built-in EQ and Drive. OP-1's excellent design means you can have a track recorded and ready for mixing in just a few hours. If you take your music seriously but want to go back to what made you fall in love with it in the first place, OP-1 can take you there. The OP-1 is the ultimate all-in-one synthesizer, sample, and controller. There are loads of neat features that help it stand out. From its sampleable FM radio to its motion-controlled effects via the G-Force sensor. It puts the fun back into music. When plugged to a MAC/PC using USB, the OP-1 shows up as a mass storage device. Ready for you to drag and drop audio files between your computer and the OP-1. The four tape tracks are available as well as sampled waveforms for you to manipulate. No additional software or drivers required. Just plug and play. This makes sampling incredibly easy and allows you to take a batch of music ready samples with you wherever you go. It simply couldn't be easier. 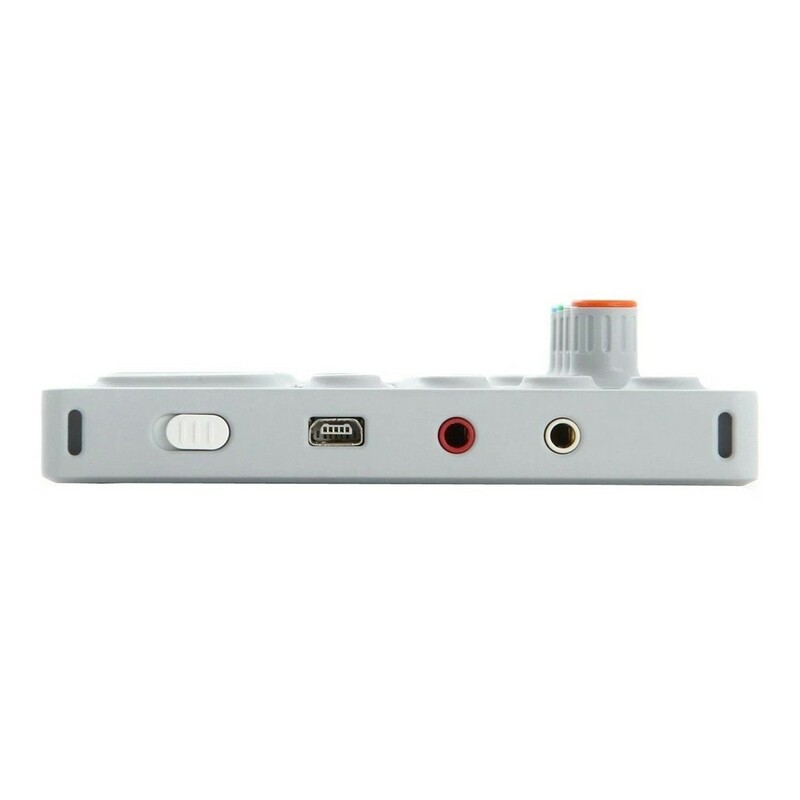 The unique OP-1 colour coded interface with colour graphics on the beautiful OLED display is directly related to the four colour rotary encoders and the legend on the keyboard. Easy reading and a non-technical way to control and shape your sounds. Finally, you don't have to be a scientist to use a synthesizer. The straight forward and intuitive workflow is designed to get you up and making music within moments. Record from the radio, sample, refine, remix, add drums, add keys - all at the twist of dial and the push of a button. If you're put off by the complexity of synthesizer then allow the OP-1's streamlined interface take you a musical journey. Playing at maximum volume you can travel over the Atlantic Ocean and back constantly making music on your OP-1 before it runs out of power. And at the same time have over two years of stand by time. 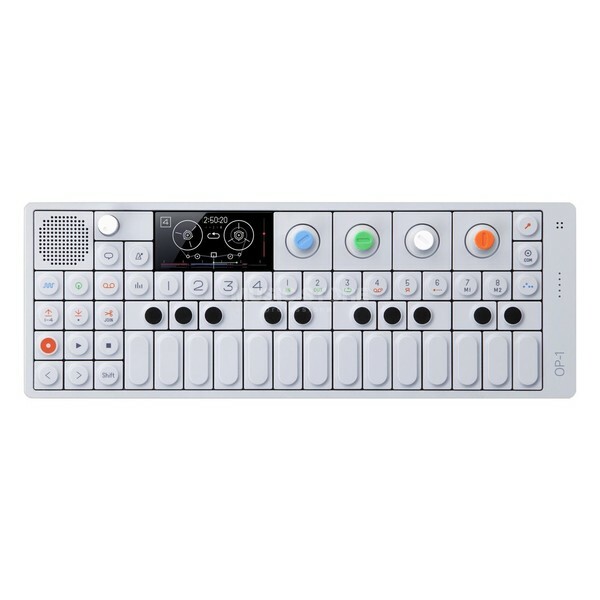 If you're looking for the ideal way to make music on the go then the OP-1 is for you. It's lightweight, the battery lasts for ages, and it has everything you need to make entire tracks. Music, everywhere.